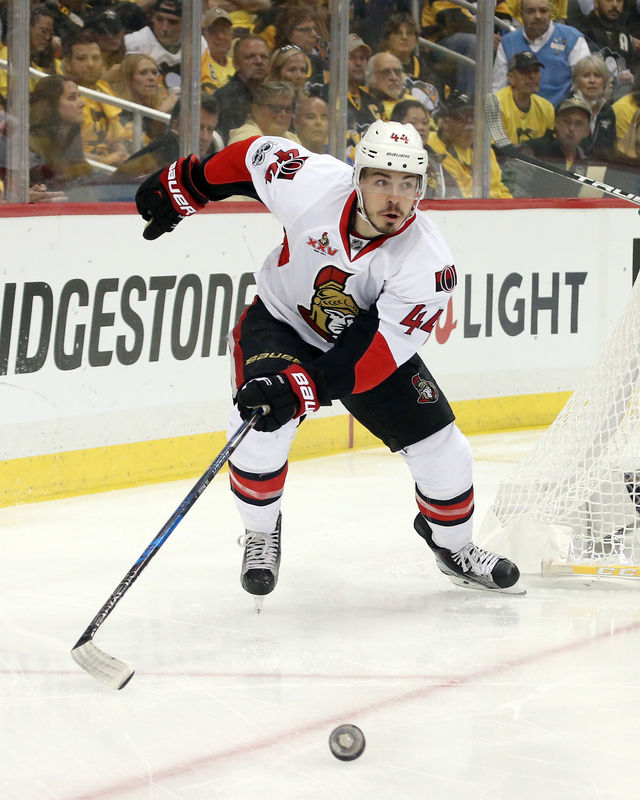 The decision has come down from the NHL Department of Player Safety and Ottawa Senators forward Jean-Gabriel Pageau will be suspended for his team’s next game. Pageau was assessed a minor penalty for boarding late in the second period of Wednesday night’s game at the Vancouver Canucks for a check on defenseman Ashton Sautner. However, the league felt that the altercation deserved further examination and held a hearing with Pageau this morning. The result is a one-game ban that will leave Pageau sidelined when the Senators travel to play the Calgary Flames tonight. Sautner goes into the corner to collect the loose puck. As he tries to corral the puck while moving up the wall, Pageau is in pursuit from behind… Pageau delivers a hard hit into his back, driving him into the boards with force. This is boarding. It is important to note that from the moment Sautner collects the puck until contact is made, Pageau sees nothing but Sautner’s numbers. This is not a case in which a sudden move by Sautner just prior to contact turns a legal hit into an illegal one. Pageau has sufficient time to adjust his course and deliver a legal hit, minimize the force of the hit, or avoid the hit entirely. Instead he delivers this hit directly through Sautner’s back, driving him forcefully into the boards. Pageau perhaps avoided further punishment due to the fact that he has no history of supplemental discipline, either by suspension or fine, as well as the fact that Sautner was able to return to the game in the third period. Nevertheless, his absence leaves Ottawa even more short-handed that usual. After trading away several core forwards ahead of the NHL Trade Deadline, Pageau was left as one of the de facto leaders of the Senators offense. Without him in the lineup, their minimal odds against the Flames are even worse. On top of that, it’s yet another missed game for Pageau, who was sidelined for the first half of the season with an off-season Achilles injury. His suspended game will be his 43rd absence in a season to forget. 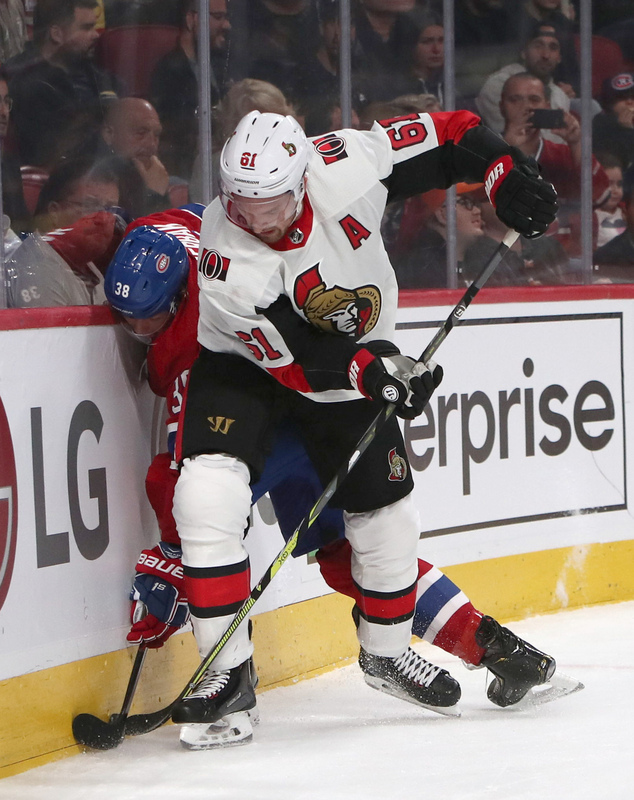 The Department of Player Safety has some work to do today, as they have announced a hearing for Ottawa Senators forward Jean-Gabriel Pageau. Pageau was involved in an incident last night when he hit Ashton Sautner of Vancouver Canucks from behind. He was given a minor boarding penalty on the play, and Sautner returned to the game. Pageau, 26, already missed most of this season after suffering an Achilles injury in training camp and now may be forced to sit out another few games. The check was clearly from behind as Sautner tried to collect the puck along the boards, and Pageau took several strides to drive through his opponent. The Senators forward has not faced suspension previously in his career however, and since there was no major injury on the play he should avoid a long punishment. Still, this is just the latest incident in what has been a nightmare season for the Senators. The team has seen their very best players shipped out of town, and now head into a summer that might bring even more change. Pageau, Mikkel Boedker, Dylan DeMelo, Craig Anderson and Mark Borowiecki are all scheduled to become unrestricted free agents after the 2019-20 season, and without extensions will probably be next on the chopping block. The Ottawa Senators season certainly hasn’t gone swimmingly to this point, as after a surprisingly good start the team now find themselves in last place in the entire NHL. An abysmal 4-14-1 record on the road is a huge part of that while key injuries have played another big role. One of those injuries was to Jean-Gabriel Pageau, who ruptured his Achilles tendon while performing his fitness testing before the season. Pageau has been out the entire season so far, but today was officially activated from injured reserve and will return to the lineup when the Senators take on the Carolina Hurricanes this afternoon. Amazingly, Pageau will return less than four months after suffering the injury in mid-September. The original prognosis was that the talented center would be out a minimum of six months, but hard work has gotten him back on the ice much earlier than expected. That’s a huge boost for the Senators, as the team aren’t in the “Lose for Hughes” sweepstakes this year. The Senators famously owe their first-round pick to the Colorado Avalanche, meaning there is no reason to tank for a higher draft slot. In fact, a little success might go a long way for the organization. Not only would winning infuse some excitement into a fan base that has been repeatedly beat over the head with scandal and rumor the last year and a half, but would also generate even more value for their potential trade chips. While many are looking at Mark Stone, Matt Duchene and Ryan Dzingel as the obvious trade chips, Pageau too may find his name thrown about in the coming weeks. The 26-year old Pageau has one more year on his contract after this season at a $3.1MM cap hit, a more than reasonable number for a center of his ability. When healthy, Pageau is a reliable two-way option in the middle of the ice that has shown a knack for big-game performances. He led the Senators with eight goals during their 2016-17 Stanley Cup playoff run, and even scored four in ten postseason games as a rookie back in 2012-13. Those kind of contributions are exactly what teams are hoping for with deadline acquisitions, and if the team decides to hold a fire sale his name will surely be asked about. For now, it’s just a celebration for Pageau as he returns to NHL action way ahead of schedule The Senators are expected to line him up between Zack Smith and Mikkel Boedker for this afternoon’s game. The Boston Bruins should get a boost just in time for the Winter Classic on Tuesday against the Chicago Blackhawks as NHL.com’s Dan Rosen reports that Brad Marchand should be ready to go after practicing today, barring any setbacks. He missed Saturday’s game with an upper-body injury, but it looks like it wasn’t a serious issue. Marchand is having another solid campaign as he has 12 goals and 41 points in 39 games this year. Rosen also points out that defenseman Charlie McAvoy remains questionable for the big game. The defenseman has missed two games with a lower-body injury and did not practice today. The gifted defenseman has struggled dealing with injuries as he has appeared in just 17 games this year, although he has 11 points. Isabelle Khurshudyan of the Washington Post writes that Washington Capitals defenseman Matt Niskanen will be out Monday against Nashville and miss his second straight game with an undisclosed upper-body injury. However, the team got better news on Brooks Orpik, who listed as a game-time decision for Monday after missing 27 games with a right-knee injury. The scribe writes that both players practiced Sunday and are both close to returning to the team. The team has also been without Christian Djoos. The Pittsburgh Penguins could be without both forward Bryan Rust and defenseman Olli Maatta on Monday as both are listed as day-to-day, according to Pittsburgh Post-Gazette’s Matt Vensel. Rust didn’t practice today with an undisclosed injury, while Maatta suffered a lower-body injury during Saturday’s game against St. Louis, but finished the game. He didn’t practice today either. Bruce Garrioch of the Ottawa Sun reports that Ottawa Senators center Jean-Gabriel Pageau is close to a return. While he’s not expected to play Monday, could be back not long after that. The 26-year-old has been out all season after having surgery to repair a torn Achilles muscle. He had a six-month timetable in mid-September and is well ahead of schedule. Pageau had 14 goals and 29 points last season. Tampa Bay Lightning head coach Jon Cooper announced that winger Ondrej Palat is not expected to play Sunday, but after that the 27-year-old is expected to be listed as “day-to-day” and could be back soon. Palat hasn’t played since Oct. 26 when he left the game with a lower body injury and subsequently was listed out for at least four weeks. That seems about right as the team could get him back at some point this week. Palat has appeared in just nine games this season and has failed to find the back of the net as he has just five assists in that span. The team needs the winger to return and re-establish himself in the team’s top-six as he also dealt with injuries last year as he played in 56 games, tallying only 11 goals. Cooper also added that defenseman Anton Stralman is being re-evaluated and will be out Sunday. The 32-year-old hasn’t played since Nov. 8 with an undisclosed injury. Stralman has eight points in 16 games. The Ottawa Sun’s Bruce Garrioch reports that center Jean-Gabriel Pageau, who has been out all season with a torn Achilles muscle, continues to make amazing progress as he joined the team on their four-game road trip in New York and skated with the team Sunday in a non-contact jersey. Despite a six-month timetable in mid-September, Pageau looks closer and closer to returning to the team quite a bit earlier than the original diagnosis. Garrioch also notes that Mark Stone, Colin White and Mark Borowiecki all took part in skating Sunday. The Athletic’s Ian Tulloch (subscription required) breaks down the play of many of the Toronto Maple Leafs from Saturday’s game. Of note, Tulloch writes that one necessity in the near future is that Toronto must find a way to find a spot in their top-four for defenseman Travis Dermott. The 21-year-old is only averaging 17:53 of ATOI, but has been used more and more, getting 23:06 of ice time Saturday. The scribe adds that Dermott has developed into the team’s top defenseman and the Toronto needs to make adjustments accordingly, which means cutting playing time for struggling blueliners Ron Hainsey and Nikita Zaitsev. After being a healthy scratch for Friday’s game, Montreal Canadiens forward Charles Hudon talked to head coach Claude Julien, who told him to be more aggressive, like he was last season when he had 126 hits, according to Montreal Gazette’s Stu Cowan. Hudon’s response was he had 13 hits in 9:09 of ice time. It looks like the break that Tuukka Rask took a week ago has been paying off for the netminder. Rask has had three impressive starts since taking a critical weekend off earlier this month, including a .938 save percentage in his three appearances since his return, according to the Boston Globe’s Kevin Paul Dupont.